DAY ONE: After we had all settled in and had a hit at the South Australian Sports Institute (SASI) the day before, we were well rested and mentally prepared for the exciting day ahead of us. There was no more time to prepare; all we could do is play our very best and hope that the efforts of our training would show. 06:30 was the planned breakfast time for everyone; we ended up being awoken early because Marcos still had his watch on Sydney time (half an hour later than Adelaide time). Begrudgingly, we all awoke to eat so we would have our strength for the big day. We left in three separate vans and made our way to the beach for an 08:30 start for some teams. 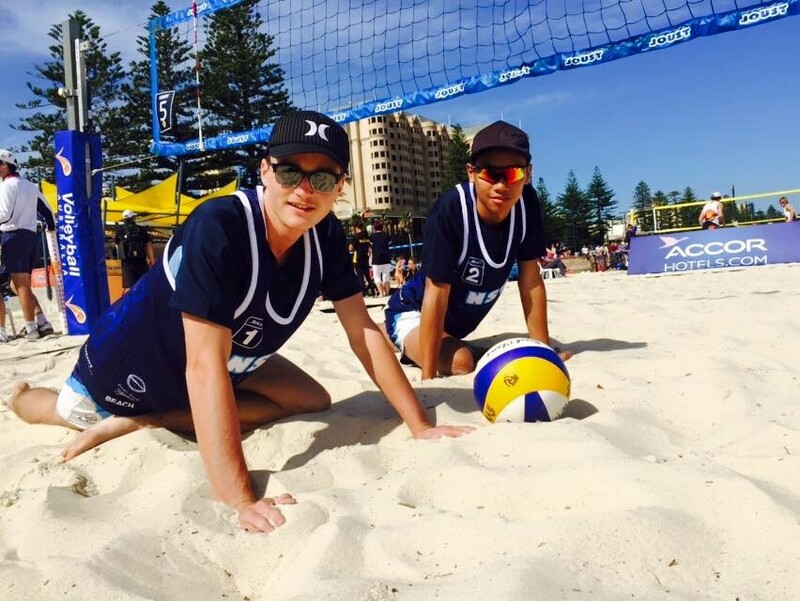 Once our feet had begun to warm up to the cold, soft sand of Glenelg beach we were already getting our serving arms ready on empty courts. Unfortunately, Lynus and I were getting prepared and getting in the zone for our games ahead so we did not get to spend a lot of time seeing what the other teams were getting up to. Our first game was at 09:50 and we wanted to start out strong as it would be the first game for our opponents, so we planned to bring to the court what they wouldn’t have: intensity. Our excitement was soon dampened however as the WA team we were going to play against forfeited due to one of them feeling sick. With one ‘win’ under our belts we reluctantly did the duty we were scheduled for and decided to keep our thoughts on ‘bringing the fire’ to the next game. We were then up against another WA team, this one however, was familiar from last year. Lewington and Hunt were our opponents and were played hard but in the end it was a win for WA. After some much needed lunch, we headed out to play our next game against QLD. This was an interesting game as we had never seen this team play up until now. So we had to be on our toes when it came to analysing their game technique. We didn’t have enough time to combat their style and we went home that day with 1 win technically, but we felt a little disheartened. After a cool down session with Roger, we switched off to get ready for our games against SA and VIC, two tough teams. DAY TWO: As our first game was at 11:10 we got to have a slight sleep in and have breakfast at 07:00. After we filled our stomachs our morning was spent scouting the strengths and weaknesses of the teams we would be up against later and supporting the other NSW teams. Our game came around soon enough and we played our hardest but SA took the win due to their experience and height. But Lynus and I came away with a lot of great tips from our dedicated coach; Roger Jones. We knew what small things we needed to tweak and what things were just out of our control. We took these tips to our next game, and although we felt a little disheartened as we prepared to play against our hardest team yet. This VIC team had one thing that we didn’t and that was height. Lynus still valiantly did the best blocking he could on such as a big team. He managed to read that they liked rolling line and peeled off to pick-up some great balls. Even though we lost, we felt that we played well. We then had another cool down session with Roger and that was it for day 2. DAY THREE & FOUR: The pool play was over and gladly all the NSW teams had made it to the next round. However there was still a challenge to go as the first game we were to face Queensland’s top seed Ferguson and Poland which eventually won the U19 category. The first game on day 3 ended with a loss to Queensland 21-15, 21-10. Game 2 of day 3 was unfortunately also a loss to WA’s Chamberlain and Haddress in a tight match of 21-15, 22-20. Coming an overall equal 13th out of 18, we worked hard and played well although we didn’t achieve the result we wanted however it was a magnificent experience to return to Adelaide for a national tournament. The return was like a test to find out how much we improved in a years’ time and the results were very satisfying to find the improvement was quite drastic. A year before me and Dion had only played beach volleyball and we began to play at UTS last season and through many weekly trainings our skills became more evident. A lot of things we learn in indoor we cannot learn as fast in beach. Just a lot a variables we can control in indoor that we can’t in beach like wind, sets, sun, and most importantly rain. Having the best court to train (RMSH) and coaches in UTS (and the fact that it was the closest access to school and home) meant that we had the best possible and efficient trainings. 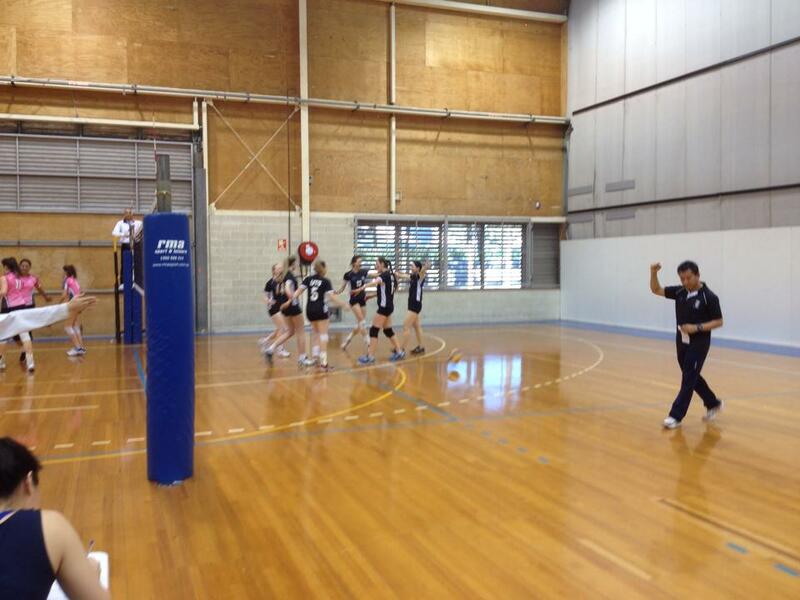 Thankyou to the UTS Volleyball Club, our Beach Coaches, Roger Jones and our NSW Head Coach Nam Pham. A smaller group of 4 teams headed over to Warriewood for the 2015 Manly State Cup on 11/12 April. In the honours competition we were represented by a combined Honours & Div 1 team, and in the Division competition we were represented by a mens Div1/2 team, and a junior boys team. In the womens division 1 competition we had a womens Div 1/2 team. Team: Haidang, Alberto, Pickles, Zach, Kel, Phil, Blair, Kris, Lee, Gino. Giving some playing upwards opportunities to a few of the Div 1 team meant that our ranks were bolstered by a few of the Div 2 team. Which was good. Having a late start of the Saturday also mean a few players who were initially missing Sunday could make our first game. Also good. We started our first game against the ASIMS very positively and with some good play, took the first set. That was very good. Then we proceeded to play with a bit of complacency in the second set and ended up turning what looked like a good win, into a draw. That was bad. Our second game against Illawarra was as assistant coach Iggy put it “the team we wish we had all the time”. One guy shanks a pass upward and backwards and 5 people chase it off court. That sort of thing. That was very good. We won the game 2-nil and nearly added the third set. That was good. That was our Saturday. We then came back for an 8am game on Sunday against the Dragons. That was ok. They only had 4 players and forfeited the game. That was bad. With a couple of fill ins we made a fun game of it and got to work on a few things. That was good. Alberto did too much passing though. That was bad. This left us with 2 wins and a draw, but with one of the wins being a forfeit we were well set up to finish top of our pool. That was good. That was at 9am. Unfortunately we had to wait until 3pm for our next game. That was bad. Our semi final was against a UNSW team that has previously won SVL so we knew we would be up against it. We played well and made it into the 20s in both sets. That was good. Blair was also not feeling well by now (and not suffering after effects from his birthday the night before) which put a dent in our offense. That was bad. Our Bronze medal game against Kaiata was a tough game with a slightly re-jigged line up. We had our moments during the game but couldn’t maintain a high enough level of play, eventually going down 2:0 and finishing fourth for the tournament. That was good. Making the medal games among a big field was a great effort, and we had good contributions from everyone across the weekend. It was good. This was the second major opportunity for the UTS Junior Boys to showcase their skill, this time in a much more demanding Division 1 Men competition. Once again we had some of our boys representing NSW at the beach volleyball nationals in Adelaide and others unavailable due to other school holiday commitments. Day one had the team meet up at Northern Beaches Indoor Sports centre at 8:15am. This meant at least an hour travel for most players and even 5am wake-ups for some travelling from Regional NSW! The day began with a quick team meeting to establish a goal for the tournament, and to ready up the boys for what was certainly going to be an eventful tournament. Game 1 began at 9am against the USYD Yellow, this game was the first amongst a different UTS junior roster. Although there was much enthusiasm and some great hitting and defence from players Bruce Feng and Raymond Vaamaanuu, the junior boys ended up going down to the much bigger and older USYD Yellow. At the end of this first game, Mark Munter (UTS Mentor Coach) gave the boys some great feedback and tips for improving their game. Game 2 had the boys up against the BHV Colts, again an older team with a lot more experience playing in division 1. The game saw some great setting from Mathew Jigalin and exceptional passing from liberos Matt Rennie and Laymond Chu. It was clear in this game the difficulties of playing in division 1 men after the inevitable change up of the roster. Despite this, the boys were playing much better than the first game and were really beginning to play as a unit. Day 1 came to an end after duty at about 1pm. Day 2 saw an even earlier start for the boys, this time at 7:30am! Having lost their coach and setter (George & Matt) due to Orthodox Easter, Laymond who was a libero the first day, bravely took to the setter position. Game 3 began at 8am against the Legends. This game saw exceptional service receive from players Joseph Phu and Hugh Catchpoole, resulting in some huge hits and some great setting by Laymond! Unfortunately for the boys, game 3 ended with a close loss to the Legends. Game 4 was the final game of the Manly Tournament for the boys. Going up against the Manly Bloom it was clear in this game the progress through the tournament truly had an effect on how the boys were becoming a team. Thanks to coaches Clara Loth and Alberto Flamigni, the boys rallied up for a great Placing Final. Throughout this last match, we had many huge blocks from middles Samuel Tifa and Sam Forbes, and even a complete shutout of the manly middle by player Joseph Phu! Although the boys were not as successful as their first tournament in Central Coast, it was clear that despite player changes the boys were definitely becoming more comfortable playing with each other. The division 1 experience will truly be helpful in the assembly of the Junior squad in preparation for SVL. Special thanks go out to Coach Clara Loth for filling in the position of Main Coach. Thank you to George Jigalin and Mark Munter for their coaching on day 1 and thanks to Alberto Flamigni for helping the boys throughout day 2. Its great to see all the senior coaches helping the boys in the Junior Program, Thankyou! Next Junior Tour …Newcastle State Cup #2! 28th & 29th March saw seven UTS teams travel a short distance north to the Central Coast. Most of the teams were using the chance to get some game time together having only started training together a couple of weeks ago. A great return from the event with UTS coming away with one gold, two silvers and one bronze, plus 2 4th places from the weekend. 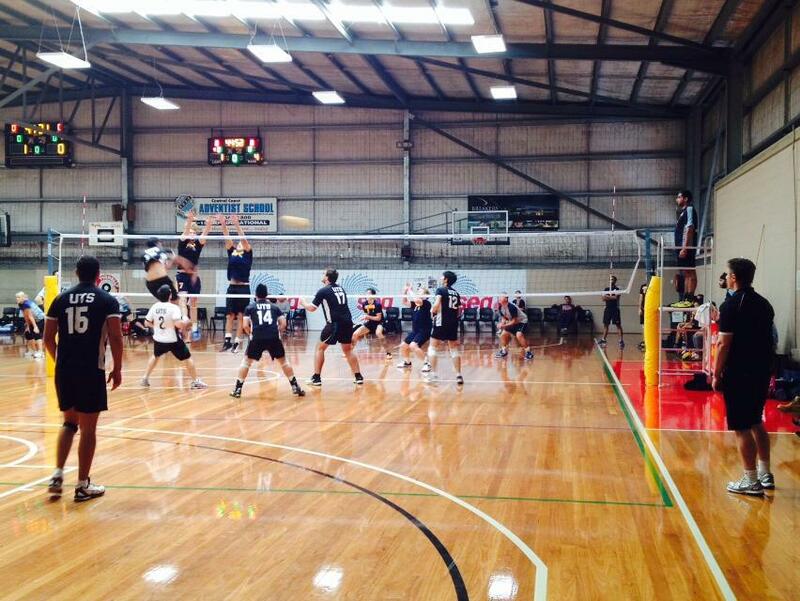 UTS White Mens Honours made the trek to the Central Coast for the first tourney of the year. The seven games played were used as an extended training session to work on a new style of play and to incorporate new players. (in particular) female spectators has increased dramatically since his inclusion into the team. after the game and in the boys change rooms. Saturday, returned back to Sydney that night in preparation for watching New Zealand please 22 million Australians by being flogged in the World Cup cricket final. Libee, smashed lots of winners, overpassed lots of free balls, occasionally served the ball into court and constantly lit up the stadium with his infectious smile. Willis Choi, showed some awesome talent both in passing and in defence and proved why a libero should be on in backcourt, rather than a middle. James McRae looked like he may make it through a tournament without getting injured or breaking down but alas, it wasn’t to be. It only took three games before he was laying in the fetal position, with tears in his eyes, crying for his mamma. He did manage to play again though as well as a managing in to play at universal for a game and not looking like a complete spaz! Doug Skinner, played some of his best volleyball as setter, except for the games against the team he was coaching, where mysteriously they seemed to know every play he was running. Dan Gauci filled in for the team when needed and added some awesome firepower with both his serving and Spiking. In the course of 3 sets of volleyball played over the weekend, he amassed an amazing 612 points, beating the previous record by almost 600 points. Standin libero (for 1 game) and assistant coach, Morky, passed so many 3 point passes in his 1 game, that the statisticians awarded him amazing average of 4.0, to go with his 72 amazing ups. The 1 all scoreline at the end of the game did not reflect the amazingness of this performance, but coach Alberto Flamigni was heard to have said “it has to be one of the best performances ever ……. outside of Italy”. Coach Flamigni also managed the team well and gave a lot of valuable insight to the players. Unfortunately, without the aid a translator, none of this filtered down to the players, who were often seen nodding and shrugging their shoulders at the same time. The team only lost one game in the double round Robin, having gone down to the experience of the Newcastle team. The same team went on to beat UTS in a closely contested final. -Stop touching the net Anna! Gosh. -Buy a watch Bruna Polegato. -Learn English Irina… or I need to learn Russian. -For the 1000th time, get off the net Carrie… Are you awake? -Use a 12 year old Libero. -Most importantly… Set Lily at ball! Bam! Awesome start to the year girls… It took us a little bit of time to get our rhythm but by the end of the tournament you played some awesome volleyball. Undefeated Champions! Well done everyone. Team: Sophie, Dede, Nat, missy, Louise, Gemma, Claire, Carly and Jo. With a couple of new players and variations with the line ups, it was great to see the girls never give up and support each other throughout the weekend of State Cup Central Coast. It was different for these girls to play in the honours division as most of them were used to division 1 and others have not played in a state cup before, but they have proven they can be competitive and achieve results at that level. We started off strong beating UNSW in our first game which put the girls in a good state of mind. With being on a high from the first game we started to loose concentration easier and fell into a hole in the middle Saturday too loose both of our next 2 games against UTS Black and United. After a break and a little discussion with the girls we picked up our game to finish Saturday with a good win against UNSW for the second time. Sunday started slower with 2 quick losses again UTS Black and United again, but the fight was still in there eyes and the hunger for the win grew. To finish the day the girls made the bronze medal match and fought all the way till the end to win in the final set 15-9. It was an awesome finish to a good and long weekend. The progress was good and potential for these talented woman shows. Well done girls and let’s keep the fight going. Team: Haiding, Yujun, Blair, Phil, Fellipe, Pickles, Kel & Cillian, with guest appearances from Alberto, Darren & myself. Our brand new team went to Central Coast hopeful but cautious. With so many new players in the team, the start (against a good Central Coast team) was always going to be a bit strange…and it was. After getting over that initial quiet though, we picked ourselves up and made a bit more of a game of it. Some big swings and some big blocks certainly helped. We stepped up for our second pool game and got away with the win against SW Khalsa. Our Sunday semi final was a close game. We won the first set, but then dropped the second. An incomplete third set left us a single point behind overall and relegated to the bronze playoff, but still a good game. Our Bronze medal playoff was against the Central Coast team who had beaten us on Saturday. We were much more aggressive and made a much better account of ourselves, but still went down 2:0. A fourth place finish and a great start for 2015! Big swing past a big block! 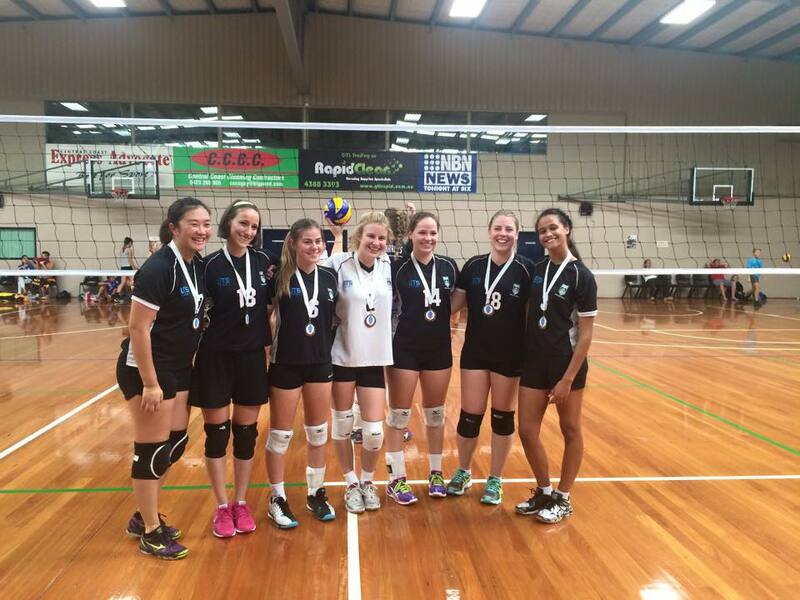 A keen bunch of youthful volleyballers ventured to Gosford to take part in the first round of State Cup. Following a succesfull 2014, all things were looking good for a great start to the 2015 season. Saturday saw the much anticipated return of Jess Ng to the team after a number of false starts the previous year. She joined Deb, Jo, Nardia, Haley, Jess, Cat and Jenny. The three Saturday pool games saw the team make light work of the opposition winning against the Belles, UNSW and Central Coast. The first game of the year saw the team take the opportunity to put in a training run for the first 15 points or so, ensuring they ironed out as many shanks, dives and missed opportunities before pulling away convincingly. The second game was more consistent throughout with Jo even deciding she would throw in some head passes as things were going so well. The third game for the day saw Cat dominate the net with block after block keeping the game in our favour. Following an early finish the team was in high spirits for the semis the following day. After watching the Honours teams do their stuff, the team commenced the semi against Manly with high expectations. Unfortunately the success of the day before didn’t transfer to the Sunday with strong serving and great defence from the opposition putting an end to the dominance of our middle attack and leading to a close but eventual defeat. The bronze playoff was a great deal closer going to 3 sets however with the same outcome as the previous match. Despite the loses you would never have known as spirits remained high throughout and fun was had (as always) by all. Medal or no medal, the outcome for all playing was exactly the same! I guess the only way now is up…well not exactly but lets hope. This weekend was a great start for the div 2 women. We went on strong after having an early and the long drive Winning both games on Saturday which comfortably landed us first place in our pool and meant we finished at 12 on Saturday and didn’t start till 12 on Sunday (CHEERING)! Maybe it was the late start on Sunday or we were tired from all the winning on Saturday but our semi against SNV went a tad sour after loosing on count back by 4 points, super annoying! However we were not going home empty handed so as our bronze medal match rolled around so did our energy and enthusiasm. Coach-less and support-less as the draws clashed we were our own cheer team ( the way it should be ) and we bought home the bronze comfortably taking down those blue bee stingers! We had great blocks from Guilana, Claire gave middle a go, Maddie and Katie’s defence was brilliant and Jali had some great plays through the middle. Wendy set the whole way round and made sure nothing hit the floor and the entire teams serving was on point. Well done girls A bronze for our first state cup – not a bad start at all! Thanks Jali, Maddie, Katie, Wendy, Guilana and Claire for a brilliant weekend and bring on the rest of the season and thank you to Deb and Jess for being amazing coaches! 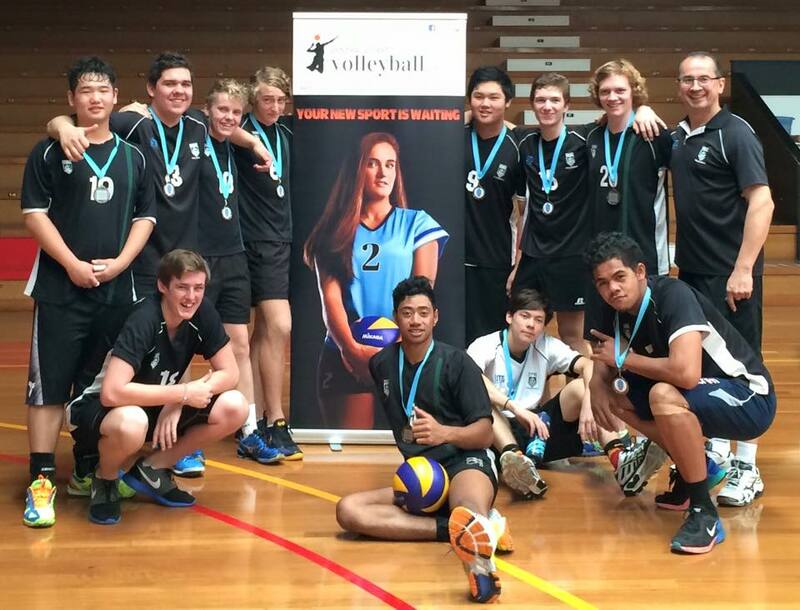 The State Volleyball NSW wrap up of the event can be found here. How have trials gone for you so far? 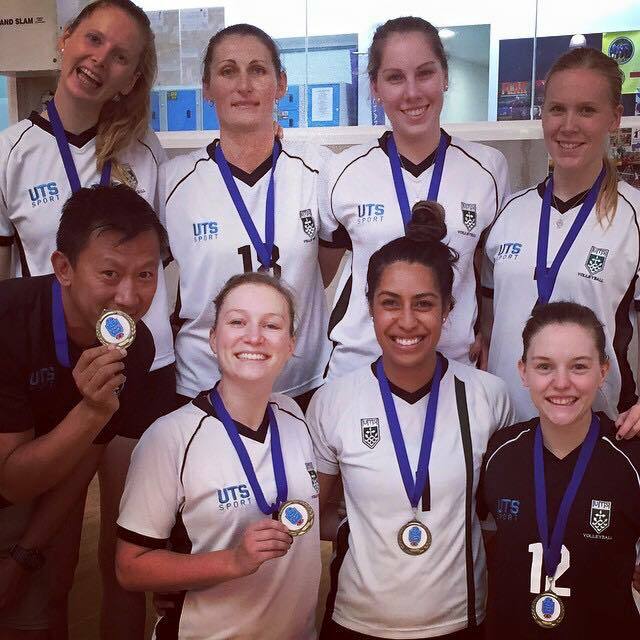 Before you accept your selection into one of the representative teams at UTS Volleyball Club you should take a look at what you are signing up for. Included here is document with everything you would need to know on how to pay fees, understand your training commitments, get the coaches contact details, as well as see the various dates coming up. Lots of fun stuff to get into. Click on the link below to get the document. 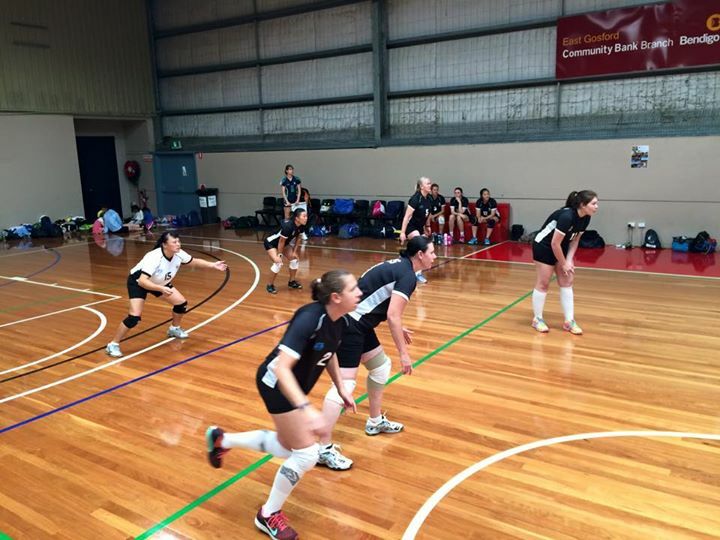 After looking through the range of applications received, coaching appointments for UTS Volleyball club for 2015 can now be announced. Just in time for to try and impress them at the last few pre-season trainings before trials start. Please note that these are subject to change following trials and final decisions on which teams UTS will field. Thank you to all those who submitted an application. 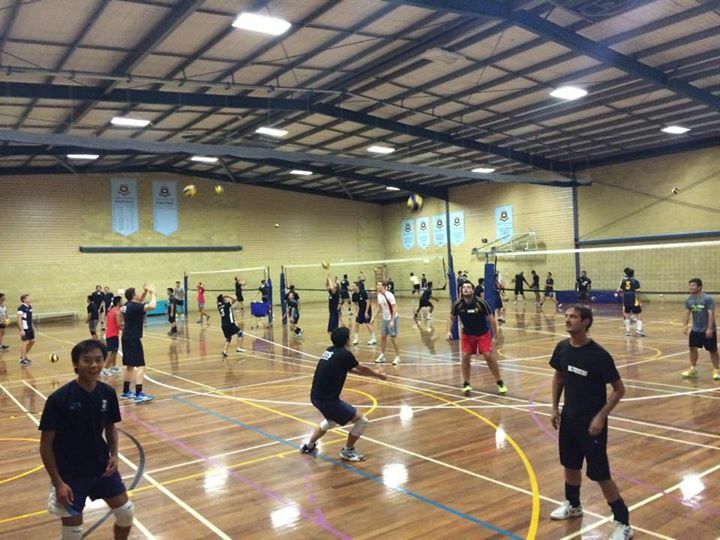 Dates have been set for open trials for the men’s & women’s senior (Honours and Divisions 1 & 2 teams) and junior UTS Volleyball representative teams. – Sydney Boys High School (SBHS), Cleveland St, Moore Park. 17th Mar – Training begins. 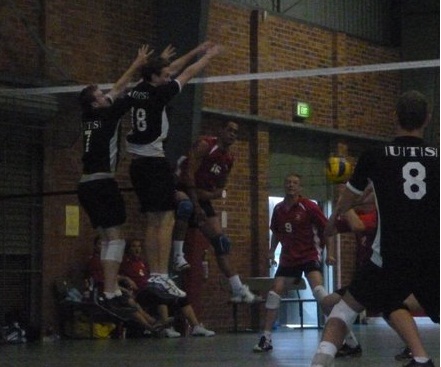 Teams will play in primarily in State Volleyball League, but also State Cups and other tournaments. Expected commitment of selected players includes attendance at weekly training sessions & payment of fees. Please only attend if you are serious about playing for the UTS Volleyball in 2015. Preseason training will start on Tuesday 3rd February from 6:30 onwards, Men and women together, for 3 weeks in the lead up to trails. 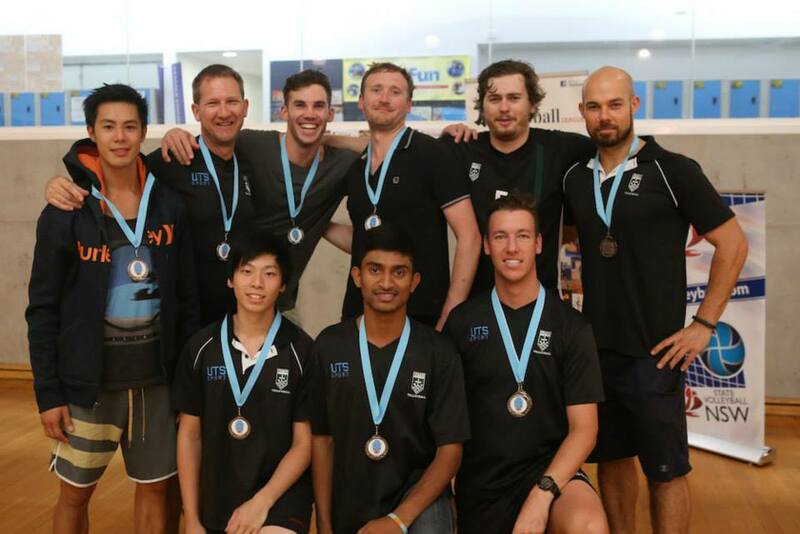 Are you interested in coaching for UTS in 2015? 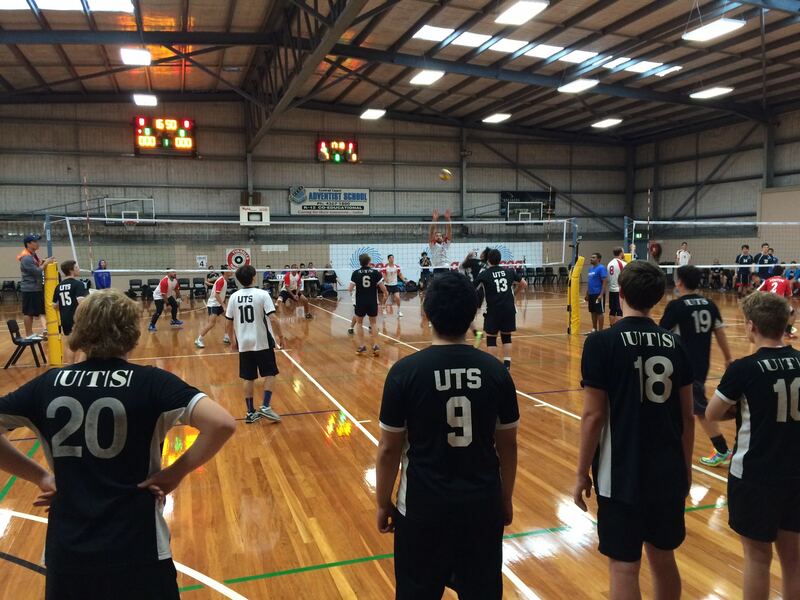 Expressions of interest for coaches for 2015 UTS Volleyball Club representative teams are now being invited. 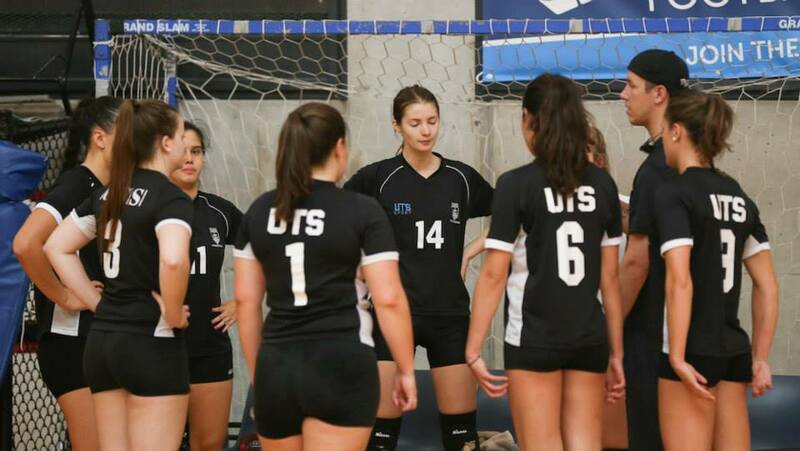 UTS Volleyball takes its coaching appointments very seriously and asks interested coaches to fill out and send through the application form as well as any other supporting documentation. Coaching at UTS is a paid position, as well as offering development opportunities, and as such we expect a level of professionalism from our coaches. Do you have what it takes to lead a team?